A shiny new penny to anyone who can find me another book that's inspired by both Samuel Beckett and Black Elk. Native American voices are mingled with urban legends in a series of vignettes that come to us from a crazy woman living by Lake Merritt, Oakland. This woman believes that she can transform into different animals and presents her stories as if these transformations are literal. 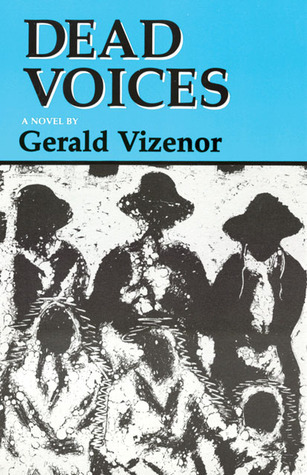 It's easy to draw parallels between her stories and Native American oppression, but such a reading would miss the larger, more varied picture Vizenor gives us. While the woman who tells the stories says they must never be written down, the first narrator writes them anyway. Vizenor might feel similar ambivalence about his own Swedish-Native American heritage - recognizing that war and conflict is what makes stories, and that the false peace of reservation life isn't creating new legends (but that city life is). Anyway, that was my interpretation, who knows if that's what Vizenor meant or not. This book was excellent. I'm not sure I get its 'message' if it has one? But it was great to read, lots of fun, and mystical. The main character is great. This book sucked. Hard. I cannot tell you how much I hated it. It made "House Made of Dawn" look engaging. I swear I want to burn it. Gerald Vizenor - Gerald Robert Vizenor is an Anishinaabe writer and scholar, and an enrolled member of the Minnesota Chippewa Tribe, White Earth Reservation. Vizenor also taught for many years at the University of California, Berkeley, where he was Director of Native American Studies. With more than 30 books published, Vizenor is Professor Emeritus at the University of California, Berkeley, and Professor of American Studies at the University of New Mexico.